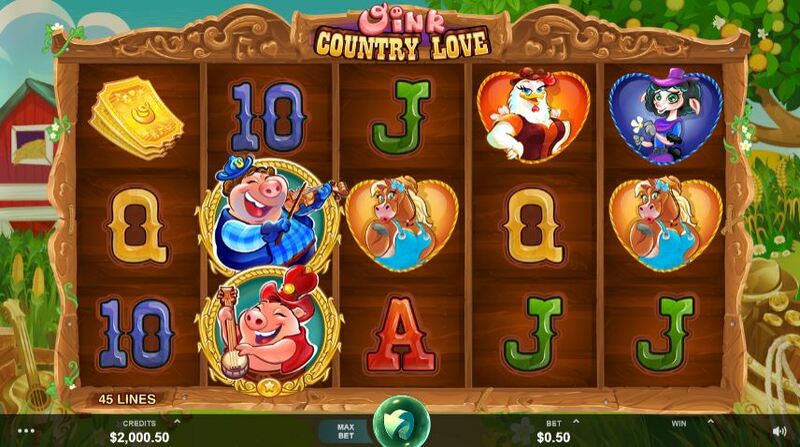 Oink Country Love slot has a rather odd title for a farming-themed game and it appears our porcine friends are in charge of this agricultural operation and look mighty happy about it too. The reels sit over an ornamental wooden kitchen unit which has somehow found its way outside into the garden (perhaps by way of Netent's Tornado Farm escape?) of the farmhouse in the background but unfortunately we get strains of country 'yee-hah' and fiddle music to ruin this vista. The reels come to a halt with an equally annoying 'boing' each time too but will this little piggy take our balance to market - or to the slaughterhouse? 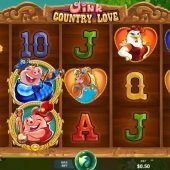 The icons on Oink Country Love are all single and we get a high number of pay lines for a 5-reel 3-row game, 45 for which we pay 50 coins per play. The game though is quite straightforward and Mr Piggy (blue) and Mrs Piggy (red) act as Wilds paying 20x bet for 5-of-a-kind. There aren't any stacked similar icons but both these pigs can appear on top of each other on the reels and pay as mixed too for 10x bet thus effectively making stacked half-paying Wilds, of which a full screen would award 450x bet. The young Pig will land you 4.5x, the Hen 3.5x, Horse, Cow and Pony all 2x and finally the 5 card values 1.8 down to 1x bet for a full line. That's the pays and we don't get any random in-play events but there is a bonus round of some potential. The EU subsidy cheque must've arrived at this farm as we get to see Golden Notes on all the reels - they appear singly on reels 1, 4 and 5 but you can see two on reels 2 and 3. This is important as we need 3 or more on consecutive reels from the left to trigger 5 free games, so one on the first three reels award 5 games, on the first four reels 10 games and on all five 20 games. Should either reel 2 or 3 be showing two it will double the total, if both do then it quadruples the spin quantity. You can get a maximum of 80 games and you retrigger them in the same way just described. There are no enhancements but triggering them is not difficult and retriggers quite usual, so you can rack up a good total for the round. If you see 3 scatters or 4 on non-triggering reels you get cash wins.